“Do the Manigault House, across the street from our hotel,” I told my Charleston trip companion, Kathie. “And go to the Charleston Visitor Center, also across the street from the hotel, and get us a bus schedule.” The Joseph Manigault House, built in 1803, was amazing but I’d seen it on a previous trip and was willing to forego it, to save time. 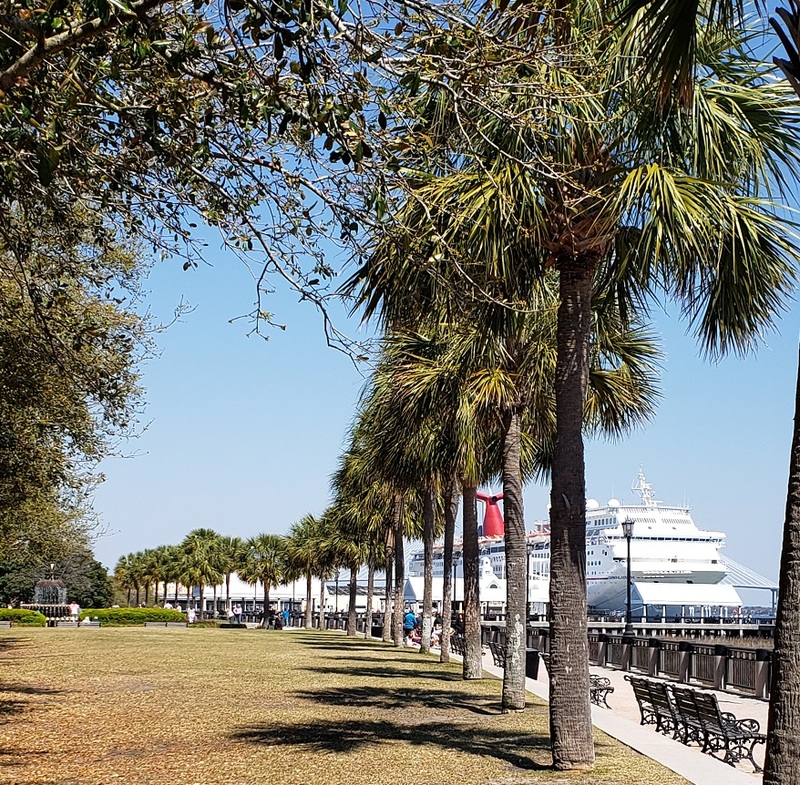 Our Charleston trip had started with a snag, when the grounding of the Boeing 737 Max 8s left both of us without flights two days before we were scheduled to leave for Charleston. We rebooked. I lost a day of our holiday and Kathie, flying in from New Hampshire, got there half a day before me. I met Kathie, back from the Manigault House, at the hotel in late afternoon. She’d gotten the bus route and schedule, so we decided on a quick get-(re)acquainted wander around downtown. Who doesn’t love a bus with “History in Every Step” emblazoned on its side. Charleston has free bus service for its downtown area and it’s a thing of beauty. There are three routes and all three stop at the visitor center. Which, as I said, was directly across the street from our hotel. 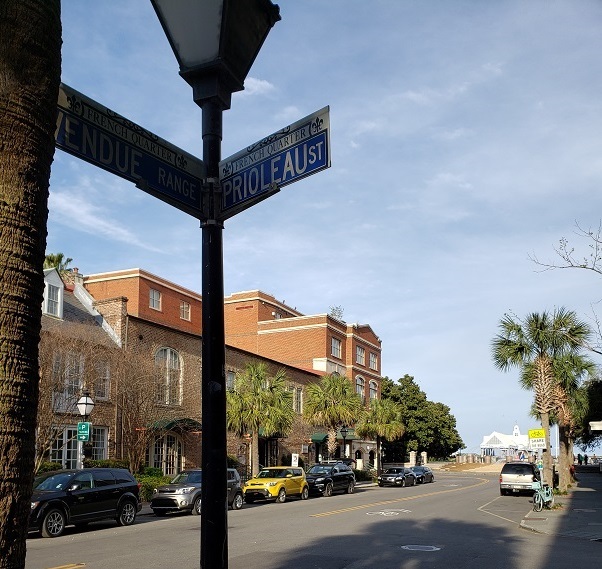 The hotel was at the northern edge of mid-town downtown Charleston and we could — and did — walk from the hotel to everywhere. But Kathie had had a major, potentially fatal health issue last year and while her recovery has been amazing, we didn’t want to test the limits of her physical abilities with the usual History Tourist hikes. 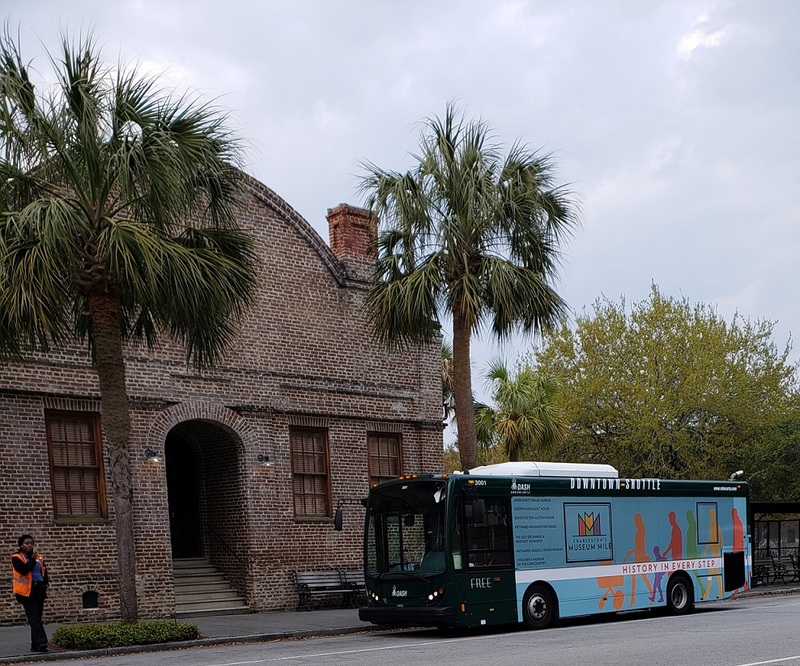 The free bus, which covered all of downtown Charleston, had stops every couple of blocks and came with remarkable frequency, was the perfect answer. We took the bus to Broad Street and walked a couple blocks to Waterside Park, so that I could get my first Stalking George Washington fix. When George Washington came to Charleston on his Southern Tour in May of 1791, he arrived by water. He was met by dignitaries “in a 12 oared barge rowed by 12 American Captains of Ships, most elegantly dressed. There were a great number of other boats with gentlemen and ladies in them; and two boats with music; all of whom attended me across….” This from GW’s diary. He landed at Prioleau Wharf. In the years since 1791, the shore line has been filled and another tenth of a mile of land added. That land is now covered with buildings and Waterside Park, and what was Prioleau Wharf is now Prioleau Street. As you can see, the docks are now more about cruise ships carrying tourists than barges carrying the conquering hero. From Waterside Park, we walked north. We were looking for a restaurant called Hank’s, which was said to be one of the best seafood restaurants in Charleston. Somehow we got confused and ended up at Henry’s, next to Historic Charleston Market. 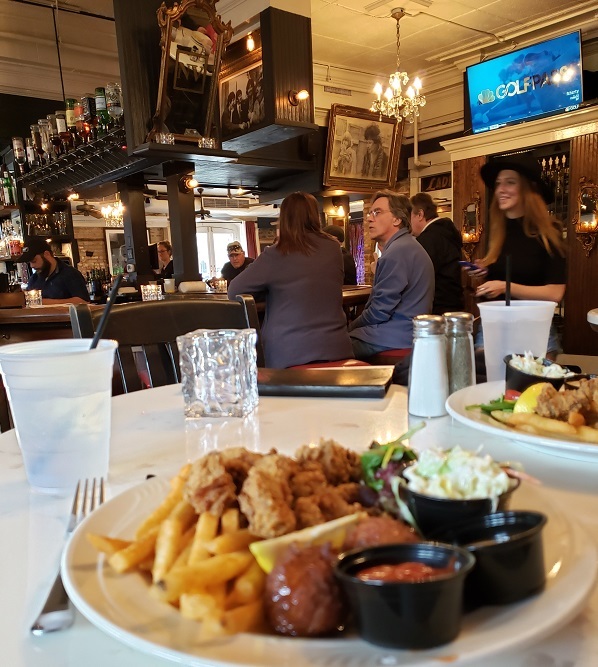 They were packed but we got a table in the bar area and both had a fried oyster platter, with fries, cole slaw and hush puppies. My arteries screamed for mercy but my taste buds were very happy. Their upper floors feature a whiskey lounge with music (often jazz) and a rooftop bar. Later in the week, at a trendy restaurant, a young and stylish chef was telling the young and stylish couple seated next to us that the place to go for late night music is Henry’s. We wouldn’t know because, being old and decidedly not stylish, we went back to the hotel and to bed. Gallery | This entry was posted in South Carolina and tagged Charleston, George Washington, Henry's Restaurant, South Carolina, Southern Tour, Waterside Park. Bookmark the permalink. How much better to arrive in a 12 oared barge than in a monstrous modern cruise ship! The barge, serenaded by musicians, would be my preference. You must! It’s an amazing city.